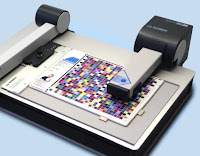 Starting May 1, 2010 Barbieri releases a new Spectrophotometer called the Spectro LFP Series 3 - which among other things can measure profiling targets using a polarizing filter. We have not seen a device with a polarizing filter since the SpectraScans were discontinued by X-Rite. At $8000, I'm not suggesting that everyone run out and buy one, but if you make printer profiles for media that has flat or bumpy surfaces like canvas or other fabrics - this will get you the shadow detail in your profiles that you won't get any other way. It's great to see a currently-produced product, that is compatible with today's operating systems, that can take polarized measurements.